Contains the official Renegade Mod Tools (Mod SDK) and the RenX Gamepack addon for GMax. Used to help modders make mods (specifically 3D models used in mods) for C&C Renegade, Generals, and Zero Hour. Created by Westwood Studios. Backup of the original version of the C&C Generals: Zero Hour AI Scripts folder. This is useful for modders who have modified their AI scripts and want a copy of the originals without having to reinstall the game. Contains a World Builder scripts (.scb) file that can be imported into your maps to add rain effects, such as ambiance sounds and periodic lightning flashes. Used in conjunction with a custom map.ini file, these scripts allow you to add full rain weather effects to your maps. See the Adding Weather Effects tutorial for more information. From the Author: I have created a menu-editing pack for people who want to make mods with Skirmish capability but do not have the time to make campaigns. This pack completely cuts out the Campaign Select menu and moves the Skirmish button onto the main menu, thus allowing faster access to the Skirmish screen and elimiating any possibility of users crashing the game by trying to play a campaign. To install, simply extract this ZIP file into your ZH directory (it is untested with normal Generals). The directory structure is contained within the ZIP file, so there is no need to worry about placing files in the wrong folder. This utility allows you to easily create waves for Command and Conquer Generals Maps. It is intended as a supplemental to the WorldBuilder tool which does not support WAK files or the creation of waves. Usage instructions are included in the download's readme.txt file. FinalBIG is a viewer and editor for the BIG files of C&C Generals and Lord of the Rings: Battle for Middle Earth. It can also open and save the MEG files of Star Wars(TM): Empire at War(TM). An addon that allows W3D files to be imported into Gmax/RenX. It also works with 3DS Max, according to the following instructions submitted by Tsumetai: "It works fine with 3DS Max (5 and 7 for sure, I don't know what you have). Just put it in [MaxFolder]\Scripts\Startup folder. In Max itself, go to the menu Customize>Customize User Interface. Click the "Menu" tab. On the right, you should see +File, +Edit, +View etc. The Plus signs are rollouts, find the location amongst the menus you want the W3D Import command to go (I put it right next to "Import File" in the "File" menu). From the "Action" list on the left, find "CoolFile W3D Importer" and drag it to the location on the right where you want it in the menus." 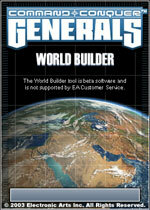 This is the official World Builder manual and tutorial for C&C Generals. It was created by Electronic Arts and requires Adobe Acrobat to view. It serves as an informative resource for fans looking to create their own maps with World Builder.